Are you a Windows 7 or 8.1 user tired of seeing Microsoft's incessant taskbar pop-ups prompting you to upgrade to Windows 10? Here's how to banish them forever. Microsoft is getting really, really annoying with its push to get people running Windows 7 and 8.1 to upgrade to Windows 10. In fact, Microsoft recently expanded its upgrade prompts to Windows “Pro” machines that had been exempt from the original effort. The most annoying part of all this is the constant taskbar pop-ups asking you to upgrade to Windows 10. If you want to banish the Windows 10 upgrade prompt, there’s already a third-party software solution out there that we covered back in November. But if you’re the DIY type, Microsoft just published an official way to banish the Windows 10 prompts by meddling directly with the registry. Note: If the term “registry” didn’t just send a shiver up your spine, it should. While these instructions are easy enough to follow meddling with the registry is not for the faint of heart. Back it up first. Before you do anything, run Windows Update to make sure your machine is up to date. Then continue as detailed below. In Windows 7, click Start and then type run in the search box and select the Run program from the results. When Run opens, type in regedit and tap Enter to open Registry Editor. Windows 8.1 users have an easier task. Click the Windows logo key + R to open the Run program. Then type in regedit and tap Enter to open Registry Editor. Once you’re inside the Registry Editor you have to change two settings. Navigating the registry editor is no different than navigating the file system using File Explorer (Windows Explorer). If you can do that, then you can find your way around the Registry. First we need to disable the operating system upgrade for Windows update. To do this, navigate in the Registry Editor to HKEY_LOCAL_MACHINE > SOFTWARE > Policies > Microsoft > Windows > WindowsUpdate. Here’s where things get a little tricky. Now we have to create a DWORD entry to make all this work. In the Registry Editor menu click Edit > New > DWORD (32-bit Value). This will create a new entry in HKEY_LOCAL_MACHINE > SOFTWARE > Policies > Microsoft > Windows > WindowsUpdate. You have to give the new entry the name “DisableOSUpgrade” and then hit Enter. The Registry Editor in Windows 10—the Windows 7 and 8.1 versions are almost identical. Next, double click on the DisableOSUpgrade entry you just created, and in the new window that opens set the Value data: to 1, click OK. The window pictured here is from Windows 10, but the Windows 7 and 8.1 versions are almost identical. Now go to HKEY_LOCAL_MACHINE > SOFTWARE > Policies > Microsoft > Windows. 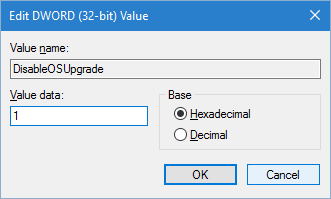 Again create a DWORD by clicking Edit > New > DWORD (32-bit Value). Give this new entry the name “DisableGWX” and then hit Enter. Once again, double click on the DisableGWX entry, and in the new window that opens set Value data: to 1, click OK, and then close the Registry Editor. Now reboot your machine and that should be it. 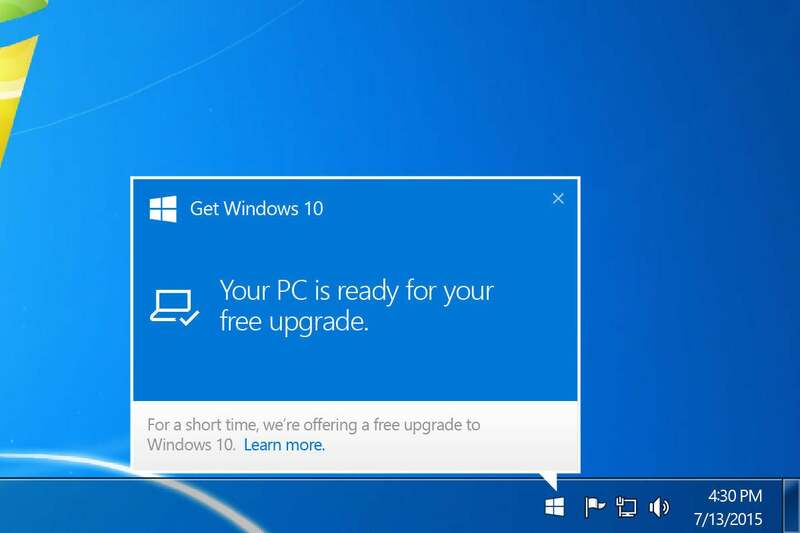 Windows 10 upgrade prompts will be banished forever.